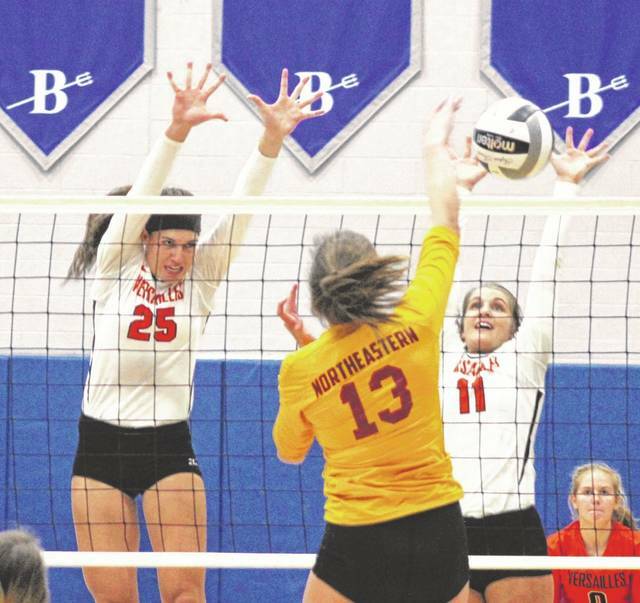 Elizabeth Ording (20) gets a kill passed a pair of Northeastern players during Versailles’ Division III district semifinals win over the Jets on Thursday at Brookville. The Tigers play in the district championship at 4:30 p.m. on Saturday against Cincinnati Hills Christian Academy. 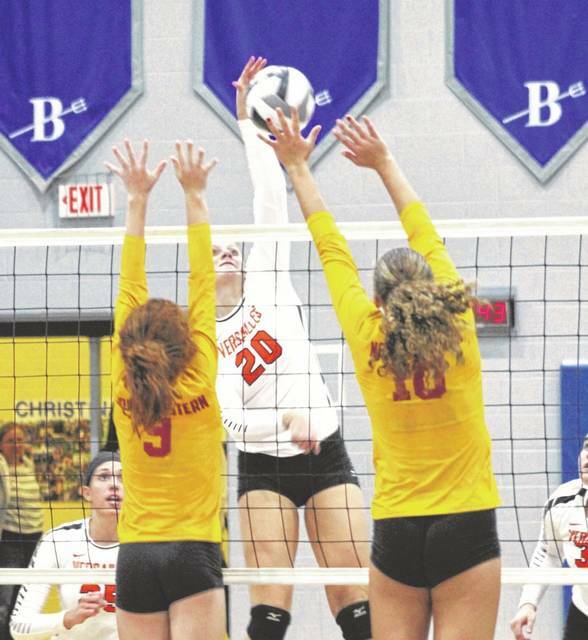 Elizabeth Ording (20) and Lindsey Winner (25) go up for a block attempt during Versailles’ Division III district semifinals win over the Northeastern Jets on Thursday at Brookville. The Tigers play in the district championship at 4:30 p.m. on Saturday against Cincinnati Hills Christian Academy. 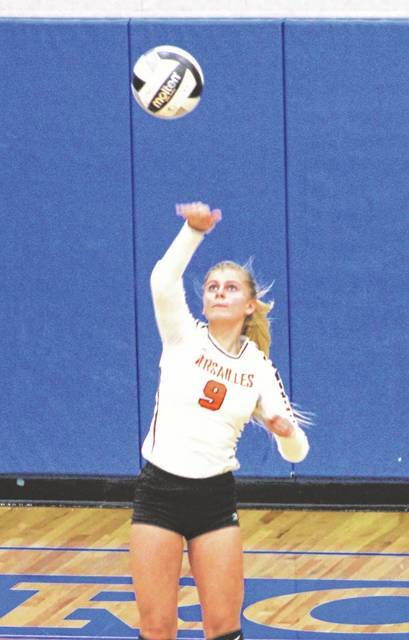 Alexa Didier (9) had a 6-0 run while serving to begin the first set during Versailles’ Division III district semifinals win over the Northeastern Jets on Thursday at Brookville. The Tigers play in the district championship at 4:30 p.m. on Saturday against Cincinnati Hills Christian Academy. 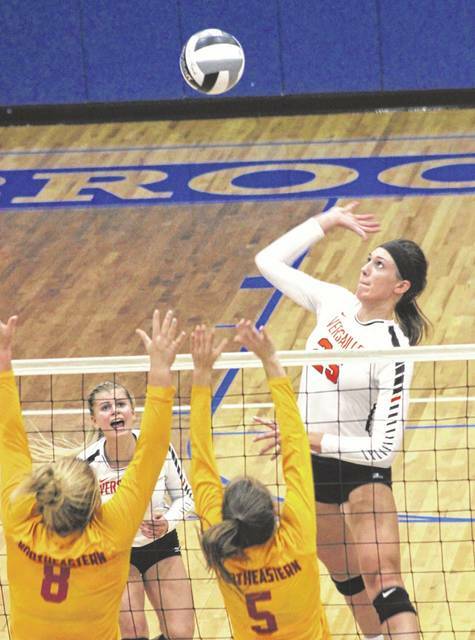 Lindsey Winner (25) gets a kill passed a pair of Northeastern players during Versailles’ Division III district semifinals win over the Jets on Thursday at Brookville. The Tigers play in the district championship at 4:30 p.m. on Saturday against Cincinnati Hills Christian Academy. 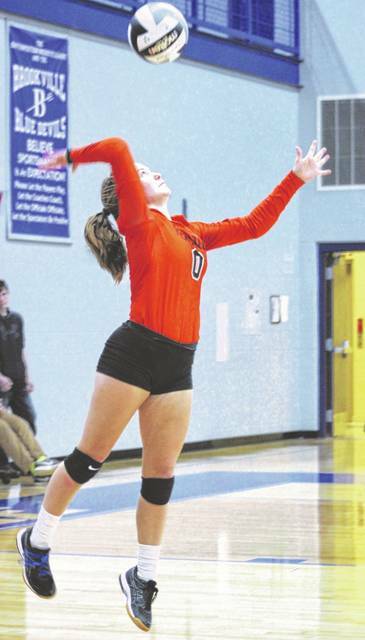 Abby Stammen (11) serves in the second set during Versailles’ Division III district semifinals win over the Northeastern Jets on Thursday at Brookville. The Tigers play in the district championship at 4:30 p.m. on Saturday against Cincinnati Hills Christian Academy. Caitlin McEldowney (0) receives a Northeastern serve during Versailles’ Division III district semifinals win over the Jets on Thursday at Brookville. The Tigers play in the district championship at 4:30 p.m. on Saturday against Cincinnati Hills Christian Academy. 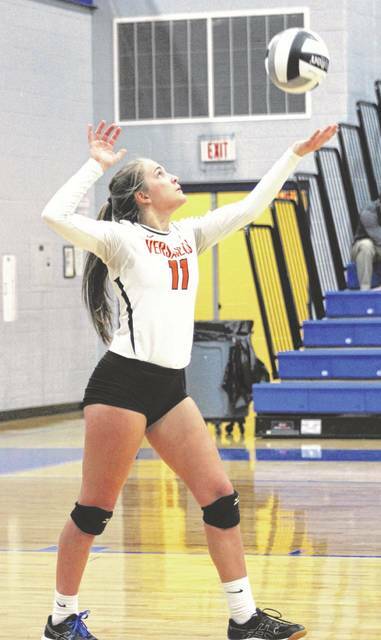 Caitlin McEldowney (0) serves in the second set during Versailles’ Division III district semifinals win over the Northeastern Jets on Thursday at Brookville. The Tigers play in the district championship at 4:30 p.m. on Saturday against Cincinnati Hills Christian Academy. Versailles players celebrate a point in the second set of their Division III district semifinals win over the Northeastern Jets on Thursday at Brookville. The Tigers play in the district championship at 4:30 p.m. on Saturday against Cincinnati Hills Christian Academy. 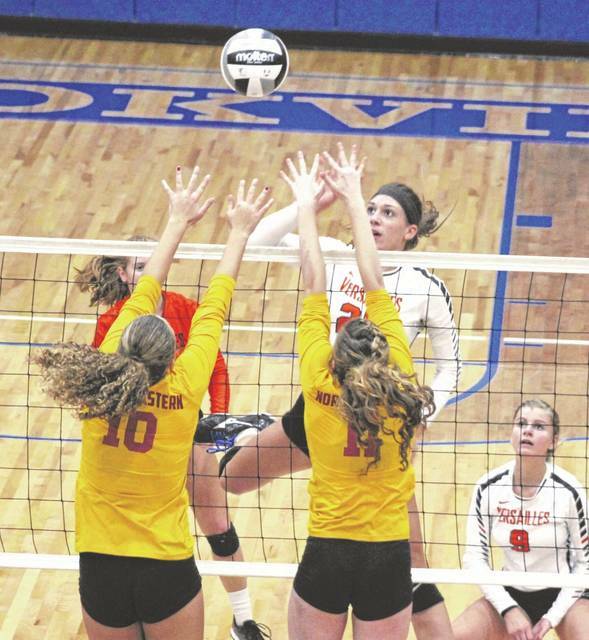 Lindsey Winner (25) and Abby Stammen (11) go up for a block against Northeastern during Versailles’ Division III district semifinals win over the Jets on Thursday at Brookville. The Tigers play in the district championship at 4:30 p.m. on Saturday against Cincinnati Hills Christian Academy. 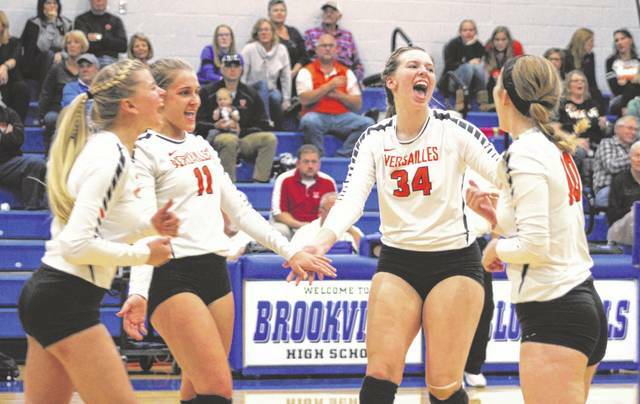 BROOKVILLE – Versailles had a pretty dominant performance in defeating Northeastern in straight sets Thursday night in the Division III district semifinals at Brookville. 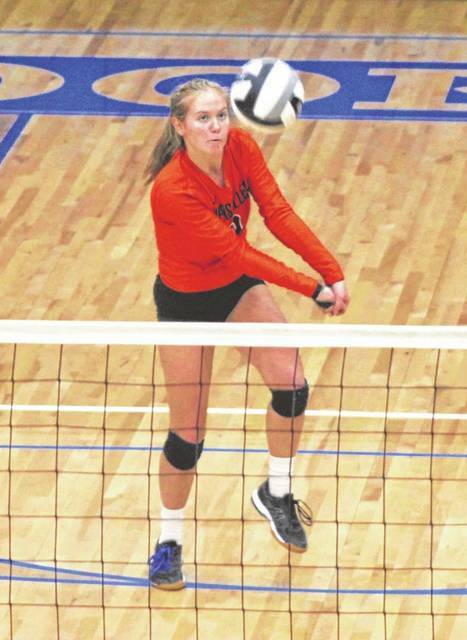 The Tigers went on a 6-0 run with Alexa Didier serving to open the first set, and then with Liz Ording on the serve, opened the second set on a 8-0 and it all led to Versailles sweeping the Jets 25-11, 25-7, 25-16 to advance to the district finals on Saturday where they will face Cincinnati Hills Christian Academy at 4:30 p.m. at Northmont. 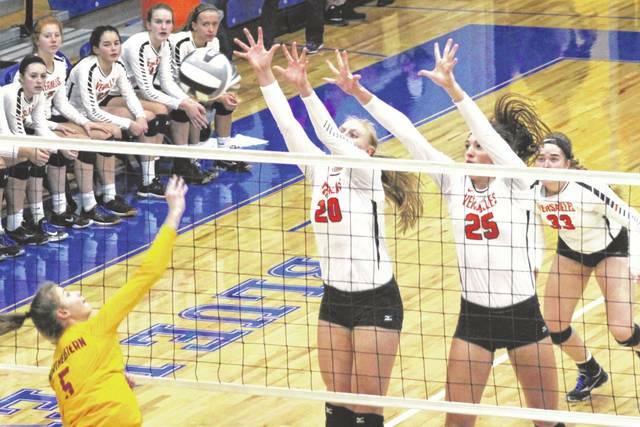 “We definitely wanted to focus on serving tonight,” VHS coach Kenzie Bruggeman said. “We told Lex that she is our first server and we wanted her to at least get three. Anything above that is a positive and she started off with a 6-0 run. You can’t ask for anything better than that. The 6-0 run in the first set included a kill by junior Lindsey Winner to make it 2-0 and an ace serve for Didier at 6-0 forcing an early timeout by Northeastern. The Jets got the very next point but the Tigers rolled again a kill and an ace from Liz Ording. Versailles never let up in running all the way to 21-9 before Northeastern reached double figures in points. The second set was just as dominant with Ording serving the Tigers all the way to 8-0 before Northeastern scored. She got help along the way with kills from Winner and Kelsey Custenborder. Winner added a few more kills and a couple of blocks en route to the 25-7 second-set win. Northeastern mounted a bit more of a challenge in the third set keeping the match close at the way to a 12-12 tie before the Tigers went on a 7-0 run to get to 19-12 on an ace serve by Didier. Versailles allowed just four more points the rest of the way in taking the final two points for the overall victory. “I told the girls we can’t be satisfied yet,” Bruggeman said of her conversation with the team during a timeout in the third set. “We did well the first two games, but we can’t be satisfied and let go of the gas pedal. We live and die by our serve-receive and we weren’t dialing in on that. We had a lot of missed serves and it was all first ball contact, so we dialed it back into that and once we kind of got that back in order it was a different game. This entry was tagged Abby Stammen, Alexa Didier, Elizabeth Ording, Kenzie Bruggeman, Lindsey Winner, Northeastern Jets, Versailles Tigers. Bookmark the permalink.